A French private art college has apologised after one of its promotional images was doctored to include more black students. 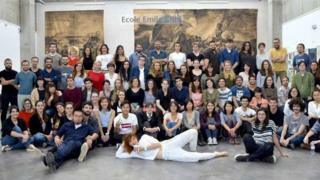 The photo of a class trip to an art gallery was posted on a US promotional website for Lyon’s Émile-Cohl art school. Students noticed it was altered to darken the skin of white students, with black students digitally inserted. The school has apologised, and blamed the doctored image on a US PR company. Social media users posted comparisons of the original image and the altered version on Twitter. On its website, a statement by Émile-Cohl college says the school was first alerted to the image by students. They say it was “retouched to change the physical appearance” of some students. It removed the doctored image from the website and apologised to those concerned, “because it goes without saying that we disapprove of this process”. The photo was intended to be used as promotional material for a new college subsidiary in Los Angeles. The college director Antoine Rivière said in an interview with French news magazine L’Express the college sent several photos to a US communications firm “to enhance the reputation of our school there”. The image was changed without their knowledge, he says. “This is the antithesis of what represents Émile-Cohl,” he told the magazine.